Ker Plunk! It's Sunday here in the Condo and time for a cup o joe and our Sunday edition. Page 1.- Really Chuck? Recently in a totally unbelievable moment, U.S. Defense Secretary Chuck Hagel and his cronies in the Pentagon got together and hurt their backs as they patted each other for the new diversity and equal opportunity in the U.S. military. Of course Chuck happened to forget the transgender military members who are banned from serving. They either serve in fear of discovery which could lead to loss of jobs and careers, or are separated from duty. For the life of me, I can not understand how this hypocrisy on the highest level is continuing to be supported by congress and especially a so called "liberal" president. How big a hole does OBama have in the White House lawn to bury his head in the dirt and ignore this? Also on the subject of trans vets, I should get a chance to meet one of the leading transgender military activists, Brynn Tannehill (shown above) at the Trans Ohio Symposium coming up this month in Columbus. Page 2.- Really Cyrsti? Like a college student who puts off studying for a long time and ends up running out of time, I find myself in crunch mode for my work shop at the fore mentioned Trans Ohio event. My basic theme is "MtF Transitioning later in Life." I presented it last year, so I know much more on what to expect. 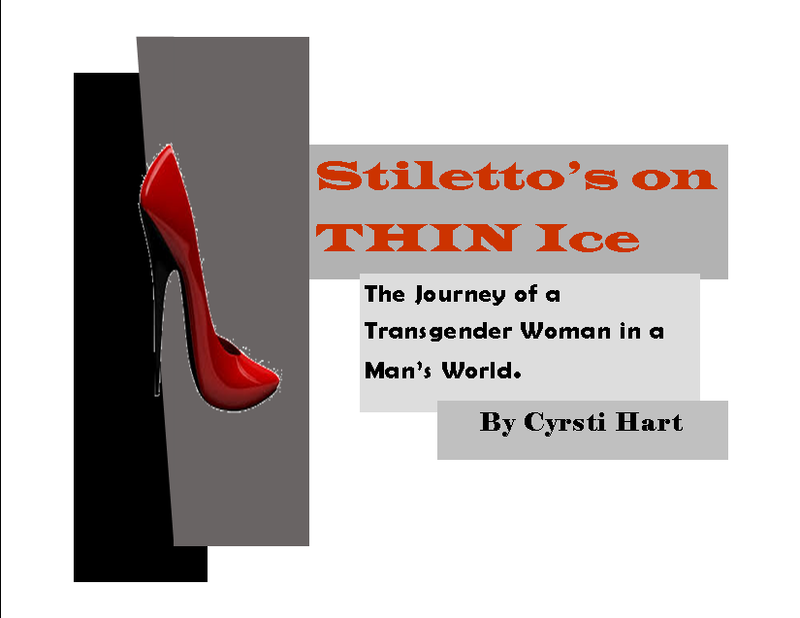 The real problem is my book, Stiletto's on Thin Ice" which I pledged to have done by then. Come hell or high water, I will, but the fact remains I'm a terrible closer. Always have had a difficult time finishing projects. To the right is a cover image I'm working on because my budget is non existent. Certainly, I'm not looking to get rich or win a Pulitzer Prize - I just want to do it-preferably before I die. Which leaves me approximately another four weeks. The 'male privilege' I was allowed was severely restricted - more like completely hogtied. Rules I had to deal with included, but were not limited to: I couldn't drive her anywhere, for any reason, at any time. We either had to take public transportation and bring a chaperone along (no public transportation available in our rural area), pay for a limousine and bring a chaperone along (the limo driver was not a sufficient chaperone), or have my father (NOT my mother - do you see a touch of discrimination there?) drive us. With the price of a limousine what it was, fortunately good old Dad agreed to being chauffeur and chaperone. To Pat, about the "The Transvestite Diet" post: I don't don't if she did too much dieting or if was a hoax or if the wife found out, but it seems to have disappeared. (Liz told me a day later the blog was gone.) My question was going to be if this person was on HRT or not. The hormones of course have a dramatic effect on weight gain (and loss). The male metabolism slows and a few of the meds want to make you eat your wall paper off the wall or maybe even your cat. But alas, we may never know. Plus normally when I plug someones book here in Cyrsti's Condo I get a response and I got "nuttin honey!" Good luck. It is harder to explain T issues than gay issues. I am sure that you will remain or at least regain hero status. At a minimum he will come to recognize the courage that it has taken for you to be true to yourself while still fulfilling your obligations of being his grandparent and the parent of his mother. Thanks Pat, he is an incredibly diverse kid already. His fourth grade teacher last year is a very out gay man and one of the top drag performers in the Dayton, Ohio area. He was just taking the easy route to connecting the dots. We all know the difference in light years of being gay versus transgender and once he grasps it, all he will have to do is change the wording from "hero" to " heroine" I hope. One way or another, it will be time for a sit down talk with him and older sister this June when they are out of school. Back Page.- WHEW! We had a lot to cover this week. I hope the delivery person didn't heave this issue through your window! As always....you all are the best and my special positive thoughts go out to all of those of you in or near where the tornadoes hit! Sort of a constant reminder of how small we really are.